Hillside Blend Black, a flavored Tea Blend based on a black tea collected and produced by members of the local Lahu hilltribe from semi-wild ancient tea trees in Fang province, in a unique way capturing the atmosphere of the forest- and cropland-covered northern Thai mountains, where the black tea for this exquisite tea blend is cultivated in altitudes around 1000 meters, through the skillful addition of a popular mix of fruit and spices such as cranberry, ginger, apple, strawberry and cherry. Hillside Green, a flavored Tea Blend based on a green tea produced by the Thai Royal Development Project in Mae Taeng, north Thailand, in a unique way capturing the atmosphere of the forest- and cropland-covered northern Thai mountains, where the green tea for this exquisite tea blend is cultivated in altitudes around 1000 meters, through the skillful addition of a popular mix of fruit and spices such as cranberry, ginger, apple, strawberry and cherry. 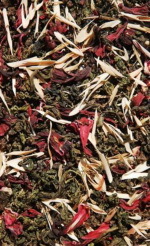 Monsoon Blend Black, an aromatic Thai black tea blend based on a black tea collected from ancient, semi-wild growing tea trees in north Thailand, masterfully capturing this tea’s theme, the subtropical Monsoon climate, through the decent and artful addition of a blend of spices, fruit, flowers and herbs such as peach, ginger, rose petals and watermelon. Monsoon Oolong Blend, an aromatic Thai Oolong Tea Blend based on our Jin Xuan No. 12 Oolong Tea, masterfully capturing this tea’s theme, the subtropical Monsoon climate in Thailand, through the decent and artful addition of a blend of typical Thai spices, fruit, flowers and herbs such as peach, ginger, rose petals and watermelon. Oriental Chai Black Tea Blend is a spicy and aromatic Thai black tea blend based on a black tea collected from ancient, semi-wild growing tea trees in north Thailand with the addition of cinnamon and ginger, inspired by the famous Indian Chai Tea tradition. For more detailed information and illustrations please refer to the productin description below. Tropical Sunset, an aromatic Thai tea blend based on a blend of a green and a black tea from north Thailand, through the decent and skilled addition of a mix of typical Thai fruit such as Mango, Passion Fruit and Papaya masterfully capturing the unique atmosphere of the Thai sunset.